Less than a year since it opened its doors, River Cottage Canteen on Whiteladies Road has been named ‘Taste of Bristol’ winner at Destination Bristol’s prestigious Tourism & Hospitality Awards on Monday 17th February 2014. More details of the Birthday Party on 20th March and other upcoming events as well as the range of dining experience and cookery demos all running at River Cottage Canteen, can be found online. For these and to see the ever evolving menu and special offers, visit rivercottage.net/Bristol or follow @bristolcanteen. 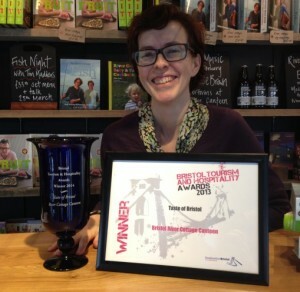 For more information about the awards, see the Destination Bristol website.